Field Trip Prep 1 and Field Trip 1 will focus on practicing knots, prusiking, belaying, and introducing you to the leader tie-off (escaping the belay) rock rescue sequence. 2. Total of 49 feet of 5mm perlon (accessory cord) cut to the following lengths. 25 feet - Texas Prusiks (don't cut yet!). Choose a different color than your other perlon. SEAT HARNESSES: Must be UIAA approved. Gear loops are desirable for carrying carabiners and other pieces. Make sure it does not pinch you while hanging or walking around in it. Waist belt strap must have 2 to 3 inches sticking out after threading through the buckle following the manufacturers’ recommendations. Study the instructions provided. BELAY DEVICES: The only approved belay devices for the basic course are the cone shaped or somewhat squared tube type (Black Diamond ATC, Petzl Reverso, etc.). Figure-8, plates, and GriGri-like devices are NOT authorized belay devices in this course. A majority of students select a cone shaped or tuber type device, namely the ATC (examples: BD ATC or ATC-Guide, Petzl Verso or Reverso, Camp USA Shell, etc.). PEAR-SHAPED LOCKING CARABINER: Large enough to clip around seat harness at waist. Either screw lock or auto-locking devices are acceptable. An offset-D locking carabiner is not allowed. 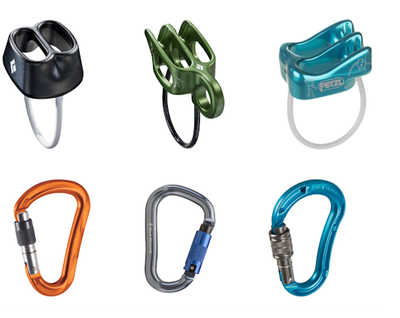 The images below are a few examples of acceptable belay devices and pear-shaped carabiners. HELMET: Must be UIAA approved (or CE marked). Note: UIAA: International Mountaineering and Climbing Federation (UNION INTERNATIONALE DEL ASSOCIATIONS D’ALPINESME). Some climbing products from Europe have CE mark indicating that the products conform to all relevant safety requirements. CE: Conformité Européenne. Below, Uriah demonstrates the leader tie-off, the current best practice for "escaping the belay:"
In what situations might you need to implement this sequence? It looks complex -- and it is! -- but when you break it down, it's really just a few knots and hitches that are used to transfer the weight of the climber onto a backup, then onto the anchor, then off the backup. Think of systems from a purpose perspective, and break them into components, and they get a lot easier!